It’s difficult to believe this film premiered 25 years ago, but this anniversary edition allows older audiences to introduce a new generation to the gentle, childlike Scissorhands while teaching a lesson on accepting those who are different. Twenty-five years ago, the world fell in love with the awkward man known as Edward Scissorhands (Johnny Depp; Pirates of the Caribbean). As a man-made creature with a heart, but an unfinished body, he captured our imaginations. He embodied shy innocence and unique inquisitiveness that made audiences view the world through a whole new set of eyes. And as a talented and creative sole, he mesmerized his new neighbors with a mix of awe and apprehension. Edward Scissorhands was created by an inventor who was tired of living alone in his castle on the outskirts of town. As he yearned for an heir, he literally pieced together a person he could "raise" and love. However, before he could finish the being, he died leaving poor Edward to live in seclusion, isolated from human interaction with scissors for hands. When Avon lady Peg (Dianne Wiest; The Odd Life of Timothy Green) comes calling, and finds the creation, she decides to bring him home and help him acclimate to society. Like the more recent Captain Jack Sparrow, Scissorhands is one of Depp's most beloved and iconic characters. He plays the role with great depth while uttering very few actual words. He says more with his expressions than most people do in a 10 minute dialogue. He is masterful to watch and commands the viewer's attention at all times. Wiest and Alan Arkin (Argo) are delightful as the typical mid- 1900's couple who take Edward into their home, and Kathy Baker (Picket Fences) is humorous as she portrays the stereotypical campy, nosey, housewife looking for a bit of excitement. Winona Rider (Heathers) is Peg's teenage daughter who needs time to appreciate Edward and his special gifts. Of all the cast, I think she has my least favorite performance, with the momentary exception when she displays awe and wonderment as Edward makes snow from an ice sculpture. The Blu-ray 1080p video quality is exceptionally good for a film that was made in 1990. The colors spread out over the full spectrum of hues and the picture quality is sharp. The DTS-HD 4.0 Master audio is good and doesn't distract at all from the picture. There are very few extras on the special edition Blu-ray, which is a little surprising for a 25th anniversary edition. The features include the theatrical trailer and a "making of" that is interesting enough, if not on the short side. 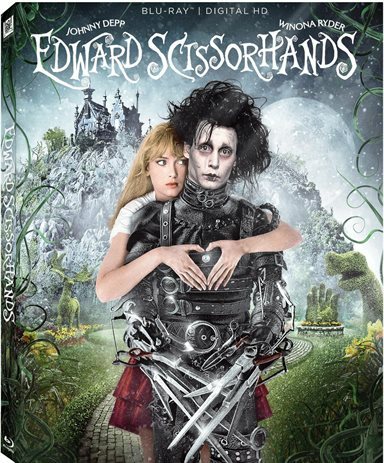 It's difficult to believe this film premiered 25 years ago, but this anniversary edition allows older audiences to introduce a new generation to the gentle, childlike Scissorhands while teaching a lesson on accepting those who are different. The script, and Depp's performance, make this movie a must own and watching it again gave me a wonderful stroll down memory lane that left me with a warm feeling. Download Edward Scissorhands from the iTunes Store in Digial HD. For more information about Edward Scissorhands visit the FlickDirect Movie Database.